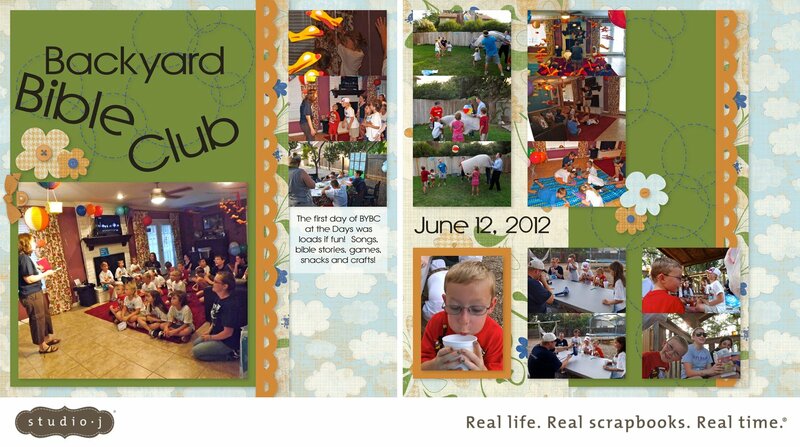 Backyard Bible club is essentially Vacation Bible School but in someone's back yard. The theme this past year was Sky so the cloud paper from Splendor was perfect! This layout has 15 pictures which is fabulous because I had TONS of pictures! I added the flowers from the Stickease and the title is actually three different title boxes! I also used the journaling box for a photo and added a journaling box below the pictures on the left! In another text box I added the date! Studio J is so easy to use and quick! I could never have fit 15 photos on a traditional layout! Give it a try! It is free to use! Click here to get started!